Philadelphia Pool Project. Credit: Sikora Wells Appel. One of the more successful tools in the new urbanism playbook is the creation of pop-up spaces. With just a handful of examples in South Jersey, we explore what makes them work. Roosevelt Plaza Pop-Up Park. Credit: Joe Sikora. For many communities, finding ways to sustain interest in local businesses, let alone draw in crowds from neighboring towns, is an ongoing challenge. Some have built along familiar lines, like restaurants and bars, experiential retail, or boutique shopping. Others are growing foot traffic with events, exhibitions, and street festivals. As redevelopment continues to be the dominant theme of South Jersey land use, where most of the local real estate inventory is well built up, activating temporary spaces is a low-cost way that many communities could generate interest in those lots that are otherwise vacant or of limited use. 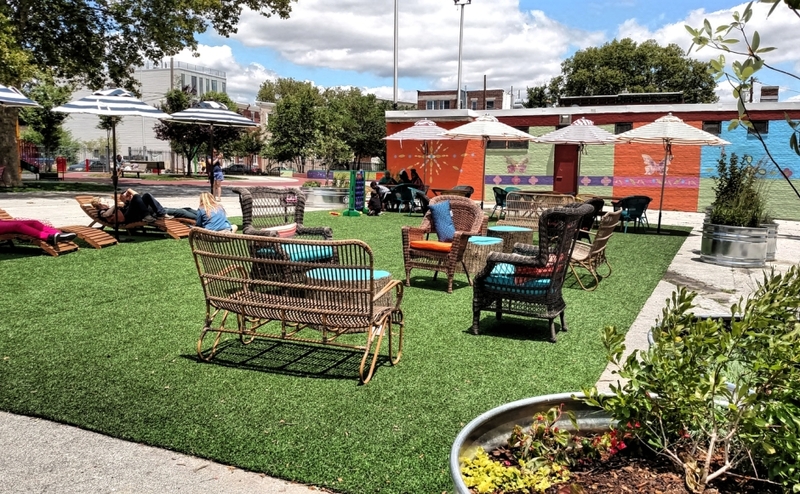 Excluding the Collingswood parklet, which has been frequently rotated through the borough downtown business district for three years, perhaps the most locally sustainable example of pop-up attractions is the Roosevelt Plaza Park in Camden City. Currently in its third year, co-designers Robert Melvin of Group Melvin Design and Joseph Sikora of Sikora Wells Appel, say the space is something of an outlier in the region. It doesn’t lean on food, alcohol, or performing arts for its success, as beer-garden and food-truck-centric spaces have, and it was not designed as revenue-generating enterprise. It is constructed with mostly repurposed materials, which have been re-used throughout the life of the project. And it’s been embraced by the residents of the city it inhabits, where safe passive-recreational spaces are scarce. Pop-up art exhibition feat. 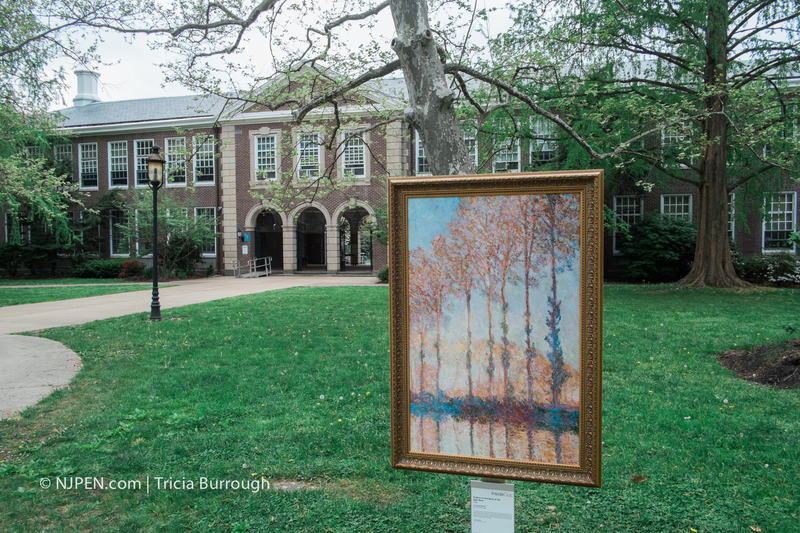 Monet’s “Poplars on the Bank of the Epte River” at Haddonfield Memorial High School. Credit: Tricia Burrough. The key, Melvin said, is programming that fits the intended audience, and which is frequently refreshed. Do it well, and “people will keep coming back to find out what you’ll do the next time. 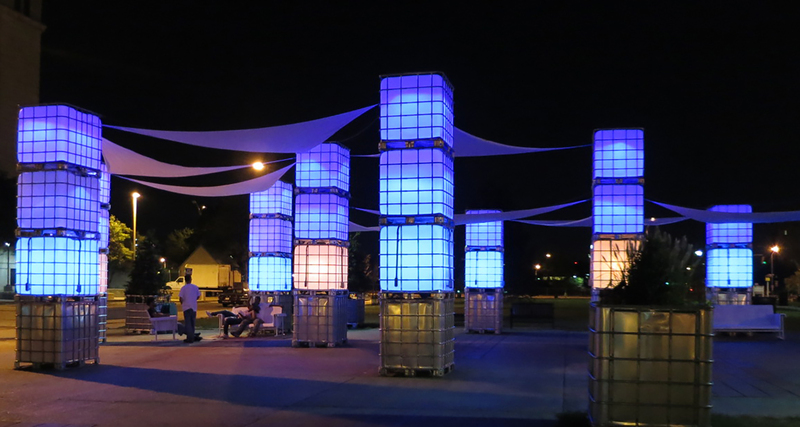 In Roosevelt Plaza Park, Melvin and Sikora have found ways to keep things fresh even as they’ve recycled many of the same materials for the past three years, including IBC totes, LED lighting, ruggedized sailcloth, and hearty outdoor planters. Such elements can bring shape and interactivity to spaces, engaging visitors through things “that are interesting and maybe artful at the same time,” Sikora said. Another benefit of the temporary nature of pop-up spaces is that they can provide stopgaps for larger, more expensive, and longer-term solutions that would require more time and energy to establish. In Roosevelt Plaza, it would take years to grow enough shady trees that could provide the same cover offered by the temporary space that’s there now with stretched canopies. 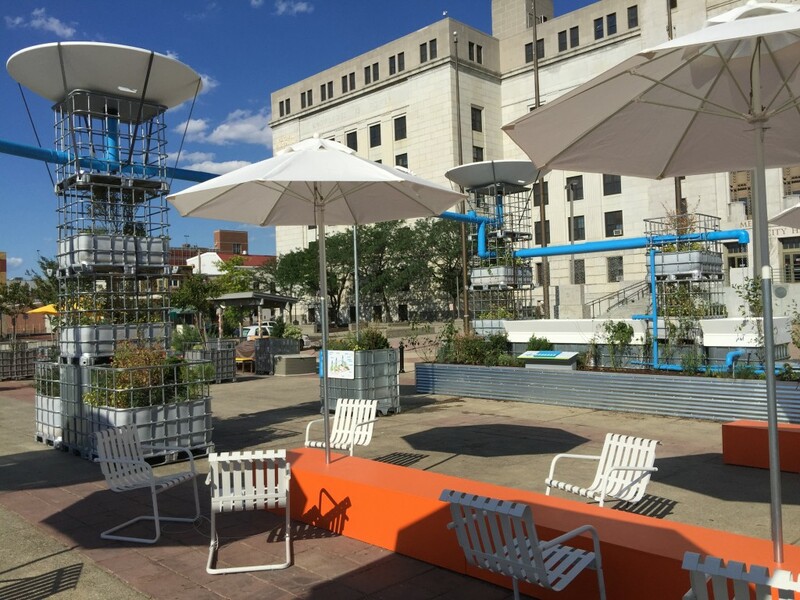 “To make the space inviting, interventions to provide shade, seating, light, can be done on a temporary basis while you’re waiting for permanent things to establish themselves,” Melvin said. IBC Totes at Roosevelt Plaza Park. Credit: Joe Sikora. Melvin’s pop-up clients share at least two characteristics, he said: excitement about the prospect of doing something different and temporary, and a willingness to take a measured risk. On the downside, such projects could be panned by critics or go unused. The bigger reward at hand is the opportunity to create a low-cost community gathering space that generates new and returning visitors. The most successful spaces take on lives of their own, with frequent users supporting the efforts as volunteer caretakers. Even in limited engagements, such as the recent eight-hour PARK(ing) Day event in Haddonfield, pop-up spaces can generate interest. In a 90-minute midday session and a happy-hour watch, Sikora said the impromptu beach scene he helped engineer outside of Community Bikes and Boards entertained a diversity of users. 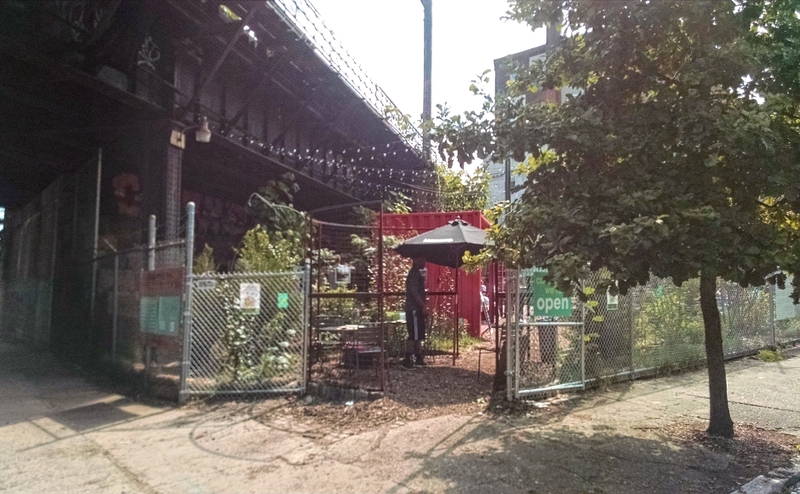 Pennsylvania Horticultural Society (PHS) railway viaduct pop-up park. Credit: Matt Skoufalos. Pop-up cultural creations are often tightly regulated and require partnerships with local governments, but they also require a hand-in-glove human infrastructure to manage and maintain. In the case of the Roosevelt Plaza Park, a partnership with Cooper’s Ferry gave the project the resources of an established local organization that could help fund its maintenance. But, as Melvin points out, its organizers “didn’t have a playbook” upon which to base their designs, and no stock solution will work everywhere. Challenges also come in the form of a “size gambit [that]is pretty broad,” Melvin said, from the acreage of an installation like the Spruce Street harbor park to the parking-space pop-ups that are measured in tens of square feet. Those constraints force designers “to eke out the most of every square inch and every element,” and the programming challenges follow from there. 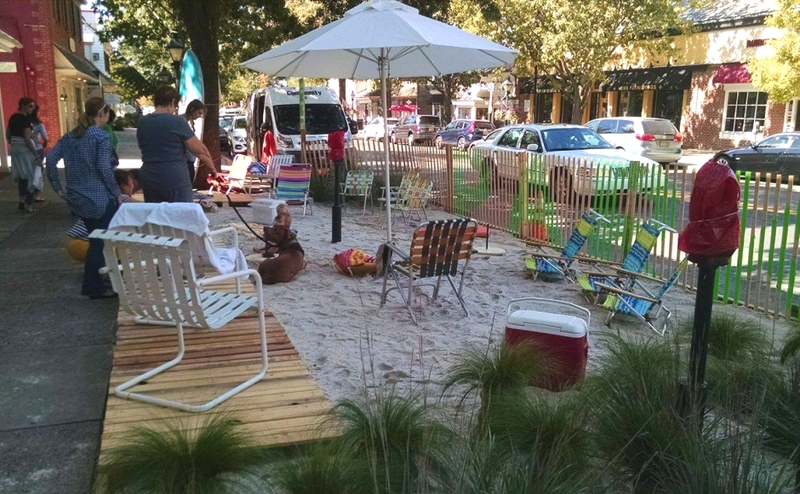 The PARK(ing) Day 2016 beach scene occupies just 41 feet of Kings Highway. Credit: Matt Skoufalos. Matthew Pultorak of The Architects of Lincroft, who organized a pop-up chat among Jersey shore architectural groups last week in Red Bank, said bringing such spaces to greater prominence requires a degree of public education and attention to existing pop-ups. The state’s shore communities, which seem ideally suited to become hubs of pop-up architecture, are not, Pultorak said. At least part of that involves communication with local leaders, and “getting them to show up is hard right now,” he confessed. Of 35 municipal politicians he invited to the talk in Red Bank, none responded. “It seems to be such a missed opportunity,” Pultorak said. Even without much up-front interest, cash-strapped municipalities can inspire attention to potential pop-up spaces by simply making them available to community groups with the desire to activate them. Camden City has had an adopt-a-lot program in place since 1990, for example. If no such group exists, communities can host contests and invite design firms to conceive of uses for the spaces, and then either build them or put them up for a public vote. A project like Figment, which takes over Governors Island in New York City for one day a year, has produced tremendous outpourings of art without burdening the local infrastructure for setup and cleanup, Pultorak said. Even in the most minimal of applications, Pultorak believes design of pop-up spaces will continue to advance. Creativity isn’t confined to budgets, but it can flourish when they are extended. Once the use of such spaces can be more broadly recognized, more of them will be seen, he believes. Future pop-ups may evolve around creating outdoor office space for remote workers, adding greenery to places traditionally dominated by concrete, steel, and glass, or simply offering a way for designers to experiment with innovative uses of existing forms and materials. “With any good architecture, emotion has to be evoked from the project,” Pultorak said. “It’s about creating a space that, if it doesn’t serve an exact purpose, it sparks somebody to do something different in their life as far as looking at the built environment in a new way.